During a press conference on the sidelines of the ongoing annual sessions of the National People's Congress, Wang summarized China's diplomatic policies in the past year and answered questions on key geopolitical issues. Wang called on North Korea to suspend its missile and nuclear tests and condemned the deployment of the Terminal High Altitude Area Defense anti-missile system in South Korea, but also gave assurances over Sino-US relations in the Trump era, and welcomed the improvement in South China Sea tensions. He summed up Chinese diplomacy under President Xi Jinping with three key words: vision, initiative and consistency. Analysts said Wang's remarks showed China's confidence in containing possible crises. "In the face of instability and conflict in many parts of the world, we have adhered to the path of peaceful development in the face of skepticism of the existing international order and system … In face of rising anti-globalization and protectionism, we have called for multilateralism, openness and inclusiveness. The consistency and continuity of China's diplomacy showed our due responsibility as a large country. It can offset uncertainties in the world and demonstrate China's confidence and firmness," Wang said. Jin Canrong, associate dean of the Department of International Studies at the Renmin University of China, commented Wednesday that the tone of Wang's comments suggests that "China has the overall situation under control." "His words showed confidence. 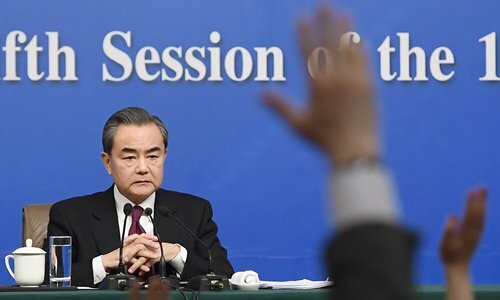 Whether it's Sino-US, Sino-Japanese or European-related issues, Wang's answers seem to indicate that none of them pose a severe problem for China," Jin said. "Many people were concerned that Sino-US ties may take a plunge under the new US administration. It didn't happen. Some were worried about the South China Sea disputes after the arbitration award last year. China managed to turn it around. What remains unclear now is North Korea, but it doesn't mean China has lost complete control," Jin said. China is willing to extend a friendly hand in response to Duterte's kind gesture, Wang said, adding that China has imported over 200,000 tons of fruits from the Philippines in the past six months and the number of Chinese tourist groups increased by over 1,000. Wang also hailed China's greater proactivity, adding that the One Belt and One Road initiative has opened a historic chapter in cooperating with the outside world. Jia Qingguo, an international relations professor from Peking University, told the Global Times that the new ideas come at a time when China's economic clout and global influence are rising quickly. "The rise of China's global status has triggered systematic reactions. Especially it has spurred wariness from current world leader, the US. The call to transcend a zero-sum mentality is an effort that will help the world avoid the possible tragedy of major power politics," Cheng Cheng, a scholar with the Chongyang Institute of Financial Studies under Renmin University, wrote in an article sent to the Global Times.